It is easy to find your way from Saga-Arashiyama station to the Bamboo Forest (10 mins walk) by following the signs or the other tourists, who all want to go to the same place. Bamboo Forest can be super crowded, since it is a famous tourist attraction. I would recommend going early in the morning. 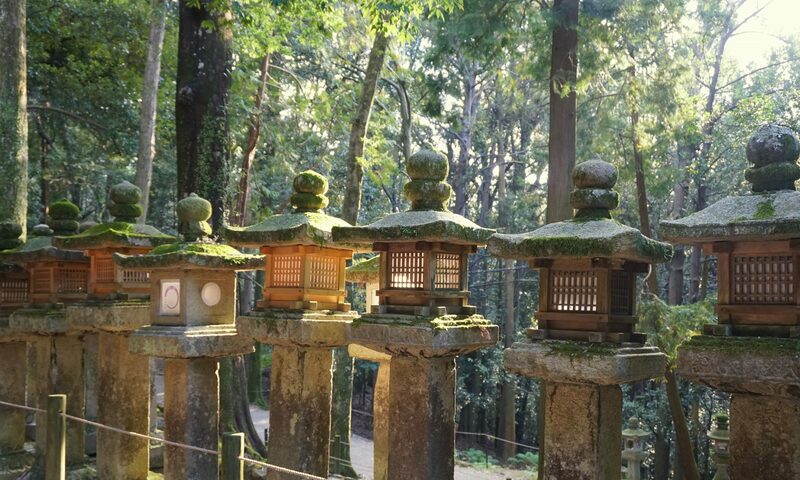 After visiting the forest and some temples along the way I recommend going to Iwatayama. You will have to cross the Togetsukyo Bridge (lit. “Moon Crossing Bridge”) on the way there. Originally built during the Heian Period (794-1185), it was reconstructed in the 1930s and is an iconic landmark in Arashiyama right now. The view of the mountains and the bridge is stunning. I imagine it must be especially beautiful during the Sakura blooming season, but it also looks stunning in Autumn. I am glad we went there, it was on my bucketlist for some time now. Now to my personal highlight, Monkey Park Iwatayama. The hike was not very challenging for us (except for my mom of course, who isn’t the fittest person anymore) and took about 40 minutes. I don’t think you need any special hiking shoes or equipment if you are a fit person, just sneakers were enough for us. Not wearing heels is common sense when going to a mountain. You will pass a small shrine on the way. Take a time to appreciate this beautiful water tap. The view from the top is AMAZING! Even on a rainy foggy day, we could still overlook the city of Kyoto! But the best part about this place are the Japanese macaques (Nihonzaru 日本猿), who run around freely among the tourists. Luckily the place is not as crowded as the bridge. I assume most tourists don’t take the hike. You are not allowed to touch the monkeys and there are a lot of signs in Japanese and English explaining what not to do: not to approach them and not to tease them. You can enter the small house in the park and buy some snacks to feed the macaques. You can only feed them while in the house! This was such a great experience, seeing the macaques so up-close. While resting during the hike, one of the monkeys suddenly appeared and approached us. It lost interest when it noticed we don’t have any food, but it was still such an unreal moment for us.